Featuring 10 mixed martial arts matches, the 17th event of Bahrain-based MMA promotion Brave Combat Federation will take place at the Nishtar Park Sports Complex in Lahore, Pakistan on October 27, 2018. Including Pakistan, 12 countries will be represented. The other 11 countries represented at “Brave 17” are Afghanistan, Bahrain, Brazil, China, France, Ireland, Kuwait, New Zealand, the Philippines, South Africa and Wales. The only fighter to represent Kuwait in the upcoming MMA event in Lahore is Ahmed “The Butcher” Amir, 27. Amir was born in Giza, Egypt. He is currently working as an MMA coach at Gold’s Gym Kuwait in Salmiya, Hawali Governorate, Kuwait. 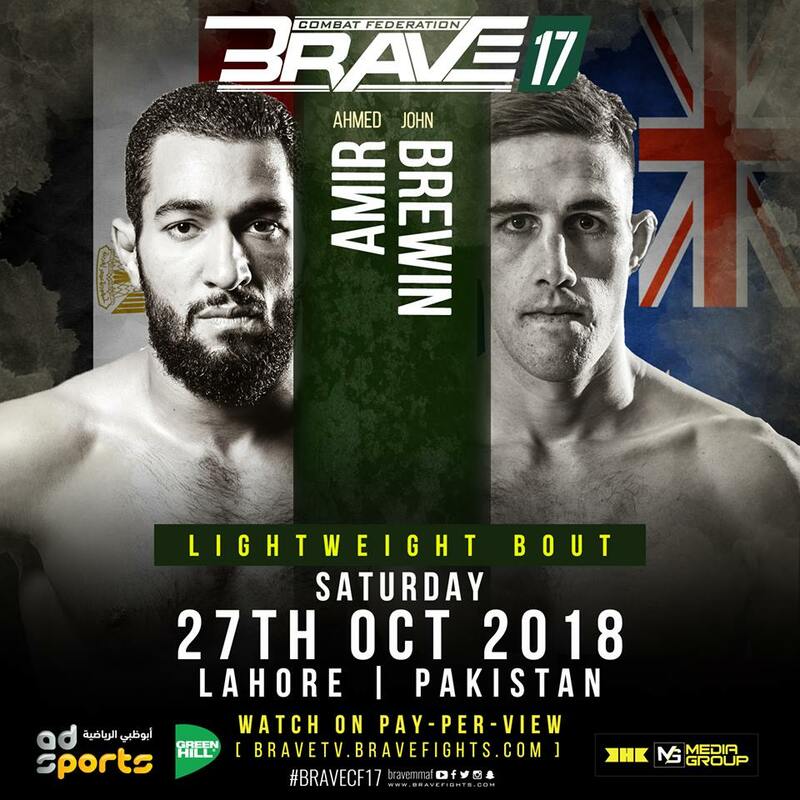 “Brave 17” marks Amir’s fifth Brave CF debut. In the fourth bout of the evening, he will compete in the lightweight division against John Brewin, 24, of New Zealand. Prior to “Brave 11,” Amir trained at the Straight Blast Gym Ireland in Dublin, Ireland where he met former UFC Lightweight Champion Conor “Notorious” McGregor, 30. Currently, the Kuwaiti MMA fighter holds a professional MMA record of 8 wins and 2 losses. On the other hand, Brewin is an undefeated fighter with 3 wins. “Brave 17” will mark his second Brave CF bout. In the co-main event of the evening, Uloomi “Kratos” Karim Shaheen, 27, of Islamabad, Pakistan will compete in the bantamweight division against Jeremy “The Juggernaut” Pacatiw, 22, of Baguio City, Philippines. The main event is between Rodrigo Cavalheiro, 35, of Curitiba, Parana, Brazil and Abdoul “Sinistro” Abdouraguimov, 23, of Nantes, France, who are both undefeated in Brave CF. Seven of the 20 fighters on the “Brave 17” fight card are from Pakistan. The event will be broadcast live on Abu Dhabi Sports in the Middle East and North Africa, making it the most broadcast combat sports event in the history of sports in the country.